Trumpet player Joe Martinez is only the second Polson student in 13 years to be selected to attend the prestigious music festival. 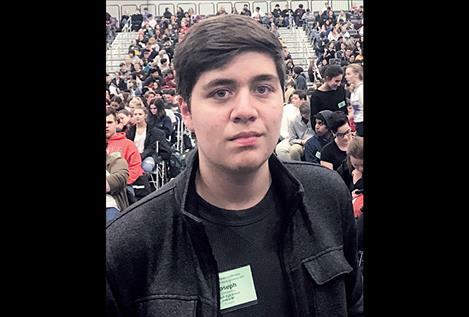 POLSON – Joe Martinez is a freshman from Polson, and his talent as a trumpet player has earned him the opportunity to perform among the best high school musicians in the northwest region of the country. Based on audition tapes, Martinez was selected to be part of the National Association for Music Education Northwest Division All-Northwest honor group. Musicians from six states competed for spots in the group. Martinez and his music teacher, Rich Sawyer, attended the bi-annual NAfME conference in Portland from Feb. 14 the 16. Martinez is only the second Polson student to be selected for the group in Sawyer’s 13 years as high school band director. The first was Martinez’s older brother, Austin, who attended in 2015. Martinez cites his older brother as an influence on his music. Martinez was inspired by his older brother, but he also wanted to stand out, so he chose the trumpet in an effort to differentiate his musical career from that of his brother, who is a clarinet player. Sawyer took part in the All-Northwest group in 1991. He said the experience inspired him to pursue a career as a music teacher. Martinez devotes a large portion of his time outside of school to practicing the trumpet. When he’s not playing music, he produces it and does other music-related activities. Martinez said he was excited about attending the NAfME conference. He thinks playing with other accomplished young musicians at the will motivate him. “It will push me to work harder,” he said. He added that he hopes to audition for the All-National group later in high school. Outside of the music, he said he looked forward to exploring the city of Portland when he wasn’t rehearsing or performing. Martinez sees the All-Northwest group as a steppingstone in a musical career he’s already decided on. He said the honor would look good on his college applications. He plans to study music production. He’d like to compose or produce music or play in a band for a living.